R|59} Study of earthenware pitcher. W. Hunt. 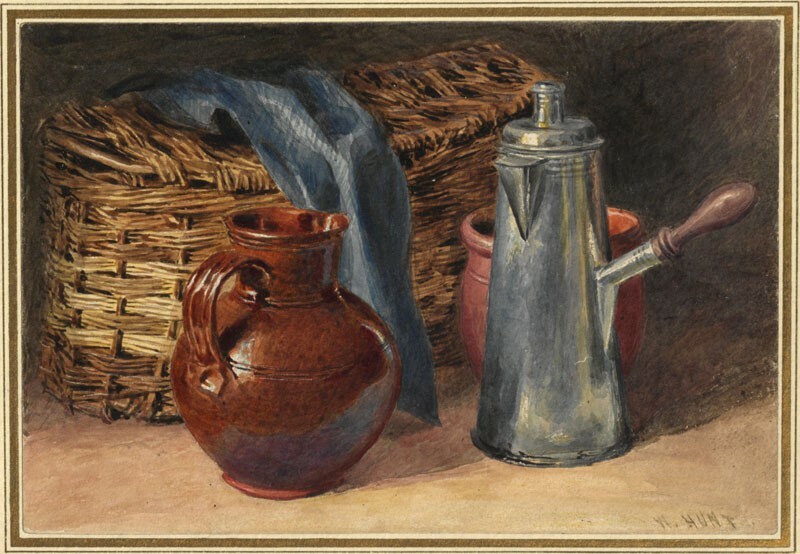 Put beside the Leonardo, partly to exhibit the completion of the older work by contrast with the imperfection of the modern, which in this case has probably been hurried, either as a lesson or for sale, but principally because the painting of the coffee-pot and brown jug is as good as such objects deserve and insuperably good in the intelligent variety of local and reflected colour. All students are to copy the coffee-pot as soon as they are able. The form of the brown jug is also a useful example of the kind of curves and proportions which are essentially vulgar as compared with outlines like those of the Greek vases in No. 51.